Latest news and updates from NANOOS! 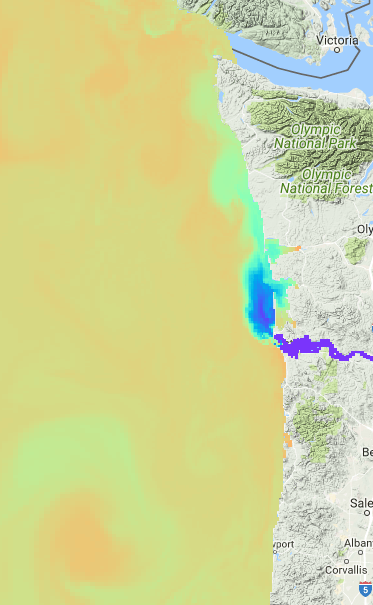 New High-Resolution Salish Sea Model on NVS! The “SalishSeaCast” model from Dr. Susan Allen at the University of British Columbia can now be accessed on the NVS Data Explorer App. This high-resolution model includes temperature and salinity now-casts from the surface to 415m depth for the Strait of Georgia and the Salish Sea. This model is funded by the Marine Environmental Observation Prediction and Response (MEOPAR) Network of Canada. 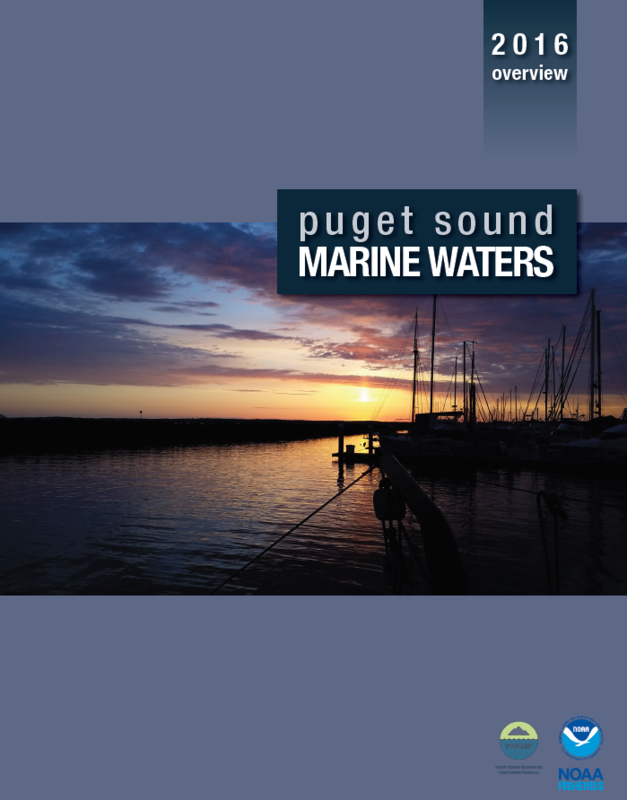 A comprehensive look at Puget Sound marine conditions for the year 2016 is now available. Physical, chemical, and biological information ranging from large-scale climate variations to local biota monitoring are summarized to provide a thorough overview of Puget Sound conditions for 2016. The report includes many contributions from NANOOS. This report is published by Puget Sound Partnership and NOAA's Northwest Fisheries Science Center as part of the Puget Sound Ecosystem Monitoring Program. NANOOS Director Dr. Jan Newton moderated the C-CAN webinar titled "Forecasting pH and aragonite saturation state in the Pacific Northwest" on January 8. This webinar featured results from two carbon chemistry forecasts featured on NANOOS. Dr. Parker MacCready, University of Washington, presented on the LiveOcean 3-day forecast model, Dr. Samantha Siedlecki, now at University of Connecticut, presented UW-JISAO's Seasonal Coastal Ocean Prediction of the Ecosystem (J-SCOPE) model, and Joe Schumacker, Quinault Indian Nation, shared his perspective as a tribal resource manager on the needs and utility of such tools. You can watch a video of the webinar here. Find us at the 2018 Ocean Sciences Meeting in Portland ! Several NANOOS Principal Investigators will be presenting at the 2018 Ocean Sciences Meeting in Portland from February 11 - 16. NANOOS will also have a booth in the Exhibit Hall on February 13 - 15. Find more information about this year's meeting here. 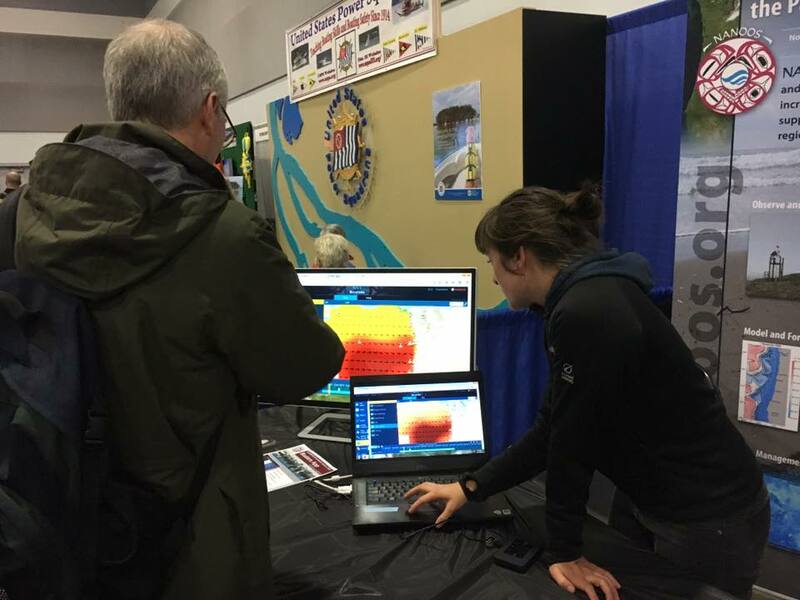 NANOOS attended the 58th annual Portland Boat Show, where boaters and fishermen learned about the NVS Boaters and Tuna Fishers Web Apps, and provided valuable feedback. Thanks to all who attended! NANOOS staff Rachel Wold will be giving a seminar at the 2018 Seattle Boat Show on Tuesday, January 30, where she will teach attendees how to use the NVS Boaters App to safely navigate local waters. NANOOS also shared space at the Washington State Parks' exhibit booth on January 26th - 27 for visitors to use NVS and ask questions. For more information on the boat show and a full list of seminars, visit this link. "Storming the Sound", January 25: This one-day gathering for environmental educators in the northern Puget Sound region has been going strong for 18 years! NANOOS and NANOOS member organizations including Northwest Aquatic & Marine Educators, WA Sea Grant and Padilla Bay NERR representatives were among the presenters and sponsors of this inspiring event taking place in La Conner, WA. See the conference site for more information here. "Sound Waters One-Day University for All", February 3 : NANOOS will have an exhibit at this year's Sound Waters annual event on Whidbey Island. This "university for all" day is an opportunity for members of the public to learn about research, conservation efforts, and culture tied to the Puget Sound region. Find more information on the event here.